Week 6: have I mentioned I’m Type-A? This week, I was 34 minutes late to a doctor’s appointment, wrote three thank you notes, scrubbed one toilet, brushed my teeth before noon on several occasions, and showered nearly every-other-day. In short, week six was ever-so-slightly productive. And this is very important to me, because my obsession with getting things done has not waned since giving birth. As the weeks go by, Dave and I are learning ways to game the system in our effort to hold onto at least some level of pre-baby productivity. One trick to actually getting out of the house seems to be dining with the old people. 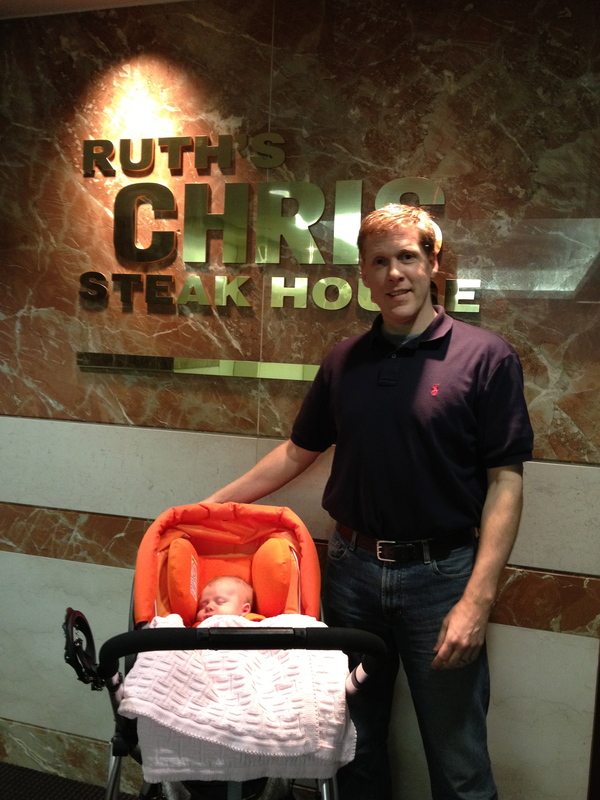 On Saturday afternoon, sweet Dave made us early reservations at Ruth’s Chris so we could have a romantic dinner with a (hopefully) sleeping infant third wheel. The key was getting there at 5 p.m., the moment their doors opened. We wanted to be sure we wouldn’t disturb the steak-eating fancy folk if Suzianne decided to get vocal. This strategy made the outing much less stressful than last time. And we were home by 6:20 p.m.
Of course, the moment we entered the apartment, she was STARVING. 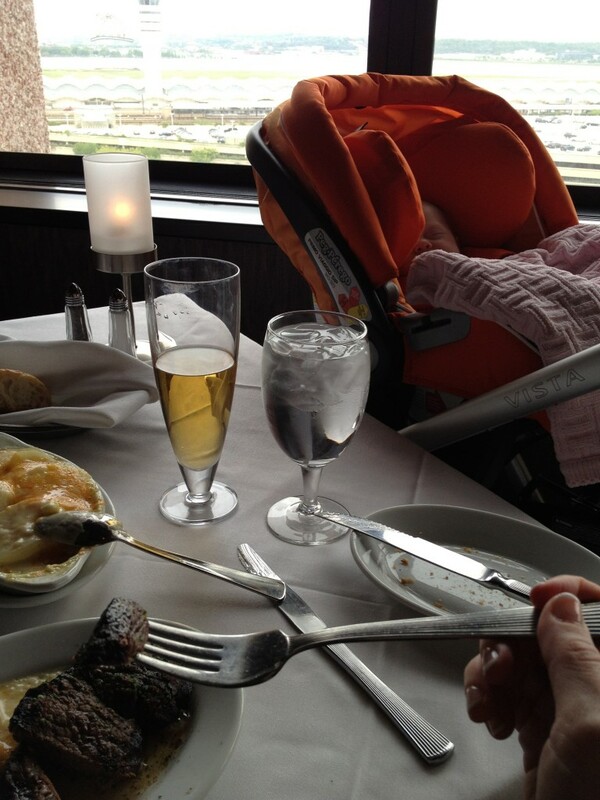 But that was okay because baby can have whatever she wants when momma has just had beer, steak and potatoes. Second trick we learned this week: make do with what you have. 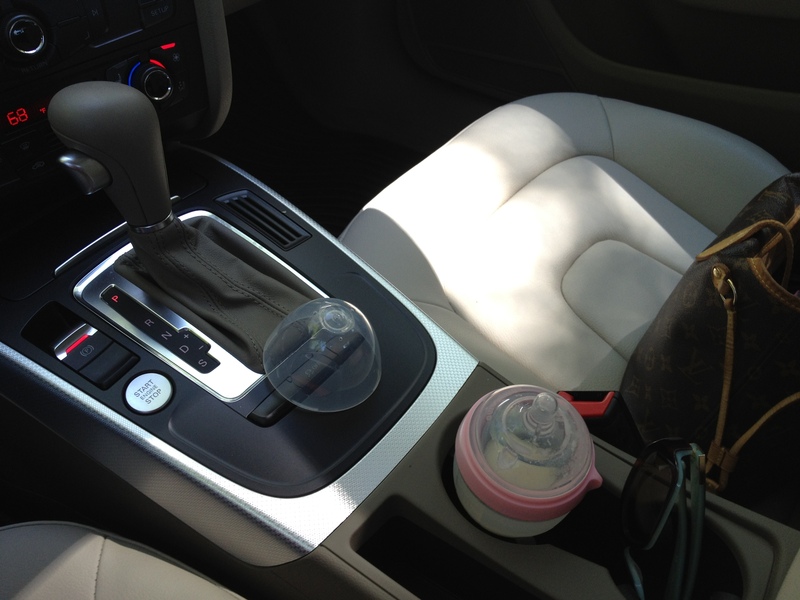 Special shout out to Dave for taking the empty Ruth’s Chris to-go bags and stuffing them into Suzianne’s diaper bag. He said he thought I might need them at some point to put a dirty diaper in. I’ll be honest with you though, I’m struggling with all the to-do’s I want to check off, but cannot. Dave and I both acknowledge life is different now, but that doesn’t mean we can change how we are wired. We are people who get things done. It will take some time for me to get used to the fact that some days, the only thing I will accomplish is feeding and loving on our baby. Deep down I know that if “keeping baby alive and well” is the one box I check off today, that’s still an awesome accomplishment. And a privilege. But it does’t make it an easy pill to swallow. In the interest of keeping it real, I’ll tell you that during week six, I really had a hard time facing this new reality. 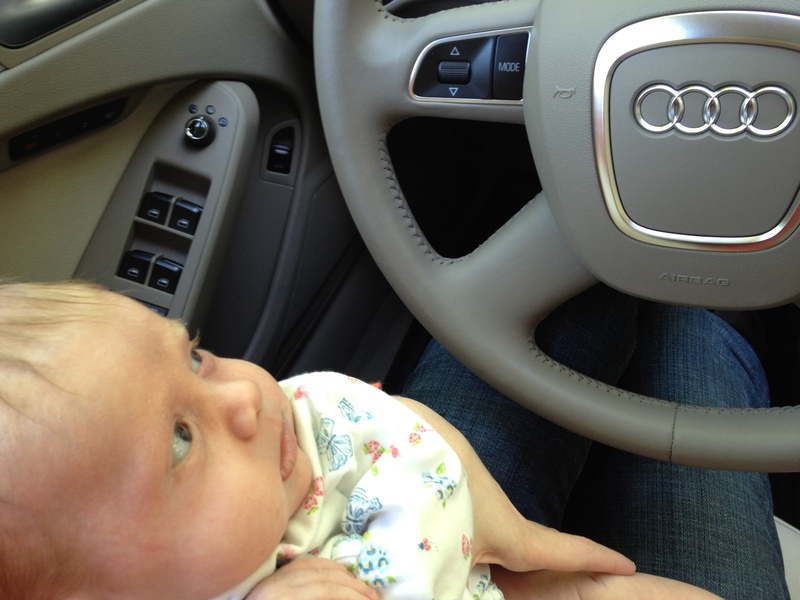 This entry was posted in Baby, Food and drink, Keeping it real, Week by week by Margie. Bookmark the permalink. You’ll get your time back, I promise. But Shannon and I discovered that dining with old people has even more advantages. You get to have a round of cocktails early and, when baby has gone to bed, you can start all over again 😉 And there’s a certain amount of freedom in taking some things off of your “to-do” list permanently–you’ll see they get replaced with things as, or more, rewarding. I’m with April. You still amaze me as the GTD rock star that you are, and I love you. 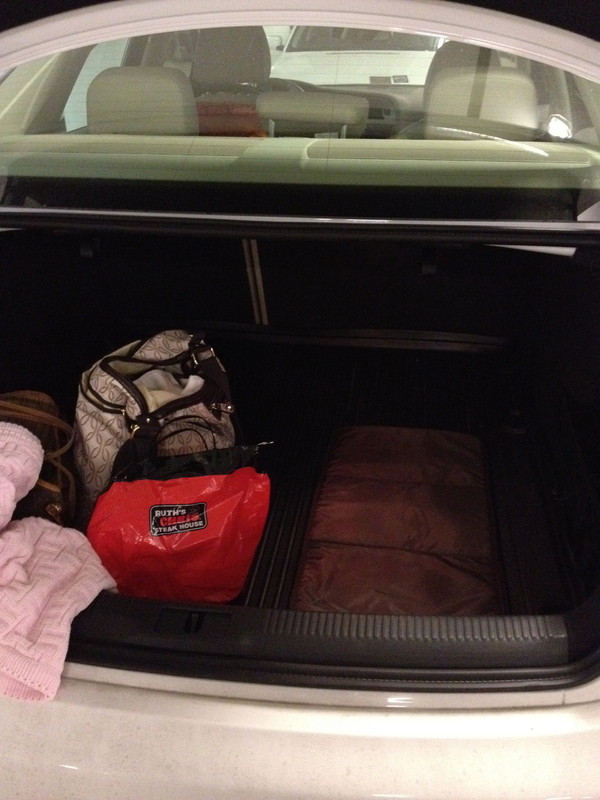 Newman and the randomly-thoughtful, diaper-bag reinforcements = what a whiz kid. “April” (HA! oh, bless) – I meant Carla.